I made this quilt by machine and quilted around each block in the ditch. The binding is sewn to the front and handstitched to the back. The fabrics are mostly Moda's Heart Aflutter line and some coordinating quilting cottons. This was a quick quilt to make and the pattern was yellow brick road. Finished size is 37" x 46". 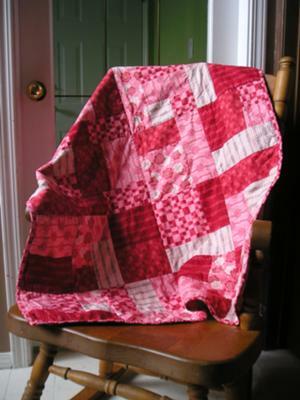 Love all the bright pinks used in your quilt, it's beautiful!